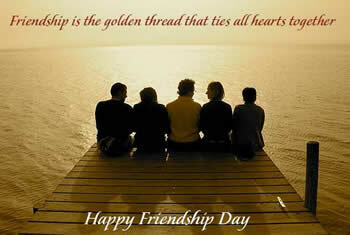 Friendship Day is celebrated on the first Sunday of August. Friendship Day is a celebration to mark the friendships in a person’s life. Celebrated every year, the purpose of this day is to reflect on the friendships that are important as individuals, whether they be with an old school friend, a sibling, a colleague or even a pet. Friendship is an integral part of our lives and our happiness. Friends come in all shapes and sizes and offer different things. People often make life long friends. People turn to friends in times of crisis and celebration. Along with family, friends can be relied upon for support, companionship and advice at various stages of our lives. Friendship day was originally conceived by the greeting-card company Hallmark in 1919 as a day for friends to exchange cards. Nowadays, many people just choose to pick up the phone and tell someone how much their friendship means, some send flowers to a friend who needs a boost, email them, facebook them or give close friends a hug. In 2011, the United Nations did declare July 30 as International Day of Friendship, as a separate event designed to "strengthen amity between people and cultures".